Facebook Live is one of its newest tools, giving users the ability to live stream or broadcast in real time with their audience. Although it hasn’t been around that long yet, many businesses are already incorporating live video and Facebook Live into their marketing strategy. Of course, it’s not difficult to see why. Facebook Live for business is a powerful tool. We’ve talked about how video marketing is the way of the future and live video is the latest extension of that, so you should already be familiar with this idea. Video, in general, is a highly visual and interactive medium and can be consumed on the go, for starters, resulting in greater engagement overall. But the intimacy of being able to connect with a real person allows businesses to build relationships and create trust much more rapidly that they could through other means. Indeed, relationships are a key part of the success of any business. Yocale can help to nourish your business relationships with our personalized emails. You can send as many as you like, for an added personal touch. Ultimately, the benefits of video over other types of content cannot be understated, which is why video is on the rise. All of the these reasons have a part to play in why 64% of people are more likely to make a purchase after watching a video. But live video takes it to another level. It offers everything that a typical video does but also much more; it’s able to tap into authenticity that no other platform can. There are no edits or cuts. It’s all in the real-time. Connecting live is the newer and better way to interact. Live video is almost like an event in and of itself, making it highly entertaining. The fact that you can connect with your audience in real-time and even answer their questions makes it even more engaging than regular video. Your audience becomes part of the conversation, which also makes it highly memorable. Few other platforms out there, if any, can compete with the engagement level of live video. It’s visual and it’s immediate. Another benefit of live video is that it allows you to take advantage of video marketing but without having to invest a lot of time and resources into creating a high-quality video. That isn’t to say that live video can’t or shouldn’t be high-quality, but given that the video is live, there is a little less emphasis on the quality of the video. The emphasis is on the connection and also providing information that your audience will find value in, irrespective of the bells and whistles that might be added later otherwise. Of course, there are other platforms out there that also offer live video, but Facebook Live is perhaps one of the best. Facebook is known for its ease of use and Facebook Live certainly follows suit. Whether you want to stream from your mobile device or from your desktop, Facebook Live makes it easy. 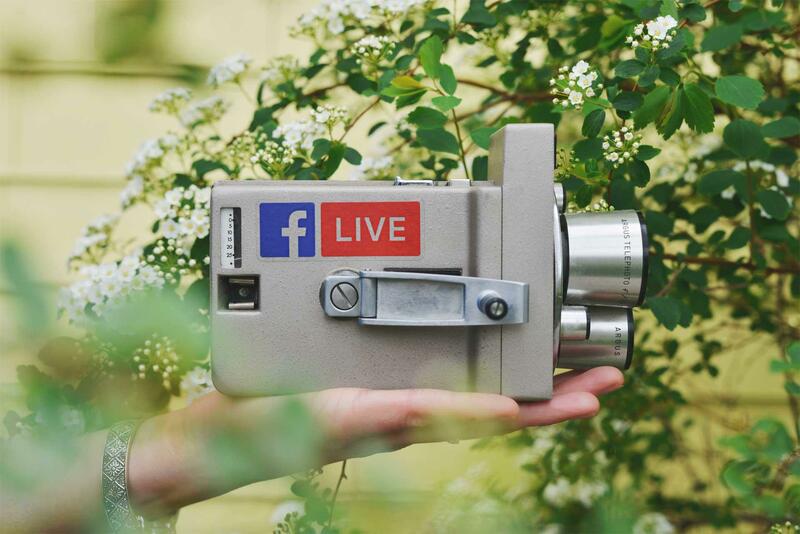 If you have yet to use Facebook Live, bookmark this article for later – it will show you how to create your first live stream from beginning to end, step-by-step, with this one showing you how to go live on the Facebook business page. The fact that you can do this all in Facebook, from promotion/marketing to the actual execution of the video, is just another one of the many benefits of Facebook Live for business. Facebook Live also saves your video to your timeline and doesn’t delete it after a certain period of time (unless, of course, you want to delete the video). You can then edit parts of it later and ultimately extend your reach even further. Consider, too, that Facebook’s algorithms naturally give priority to Live videos (and videos in general), therein allowing you to increase your reach over general Facebook posts, etc. In short, live video and Facebook Live, in particular, have massive potential for businesses to build trust with their audience and ultimately increase their bottom line. That’s true for all businesses, big or small. The ideas for Facebook Live are virtually endless, but here are some of the best ways to use Facebook Live for business. The key to any live stream, regardless of what kind of content it is, is to make use of the description section. There are a couple of reasons for this. First of all, an interesting description entices users to tune in. Secondly, it is a great place to include keywords for SEO purposes, as well as to include calls-to-action, whether for products mentioned in the video, to visit your blog, or for another purpose. Don’t forget to direct your audience’s attention to this a few times during your broadcast – that’s key. Here are a few other tips for using Facebook Live you might want to take note of, courtesy of Facebook themselves. The great thing about using Facebook Live to respond to blog comments and do Q&As is that you know your audience is particularly interested in the topic and will find great value in it. Further, it is also time-saving. Instead of typing out individual responses to blog comments (and responding to comments is always important), answering them live is much more efficient. A spin on responding to blog comments is to do a question and answer session. Take a cue from Mark Zuckerberg himself; he frequently does Q&A sessions on Facebook. This is perhaps one of the best Facebook Live topics. Giving your audience the opportunity to have their questions answered makes it incredibly engaging and personal at the same time. You can make all of your live videos even more personal by addressing your audience by their individual names. You can also use Facebook Live to answer frequently asked questions. Then, when the question inevitably comes up again, you can direct them to your video and save time yet again. As far as Facebook Live content ideas go, this way to use Facebook Live for business is related to the above, but instead of answering general questions, you specifically answer customer-service related questions, whether that’s a problem they’re encountering with your product or service or any other customer service-related question. This approach takes your customer service approach to the next level and really sets you apart from other businesses, making it yet again one of the best ideas for Facebook Life when it comes to business. Consider contacting one of your customers via Facebook Live and solving the issue in real-time. Even if you only do this for a couple of customers and respond to other inquiries in a more traditional manner, the benefits of taking this extra step can make your business particularly memorable. Similarly, if more than one person is having a similar issue, you can address their issues at once via live stream, giving them the opportunity to ask any questions in real-time and ensuring that the problem is solved right then and there. Interviews are always a good choice of content, whether for a regular video or podcast. They make for interesting content, giving the audience the opportunity to hear insights from someone they might not have otherwise been able to hear from. However, interviews are particularly suited for a live video, garnering a lot engagement. In fact, one of the most common Facebook Live Formats is the AMA (Ask Me Anything) format featuring a guest. In fact, according to Mark Zuckerberg himself, live videos receive ten times the amount of comments that other types of videos do. They tend to attract a lot of attention, not only because of the special guest aspect, but also because of the engagement that comes with the audience having their specific questions answered. The key in all of this is to promote your products/services as the solution to the question as often as possible. Sephora’s video use is a great example of this. The cosmetics and beauty company Sephora invited a couple of guests, one being Ouai Haircare’s Jet Atkin, where they discussed everything from tips to trends and everything beauty for thirty minutes. In nearly all of their answers, they incorporated their products as solutions. The mix of expertise and intimacy lends itself very well to people researching the products and, ultimately, to them making purchases. First and foremost, people love content that they typically wouldn’t have access to. Right off the bat, giving your audience a behind-the-scenes look is instantly entertaining. Not only is a behind-the-scenes look entertaining, but it is also a great opportunity to provide your audience with educational information that they may actually find helpful. For example, perhaps you run a salon; your customers might be interested in a look at how to expertly blow-dry hair for that perfect at-home blow dry. In other words, the behind-the-scenes look should provide value and be helpful in some way. Take this as an opportunity to give them information you know they will want. That’s ultimately the key when it comes to giving them a behind-the-scenes look. Here is a look at some of the best ways businesses have used Facebook Live to date. Another behind-the-scenes type of video is to showcase a specific employee. The benefit of this particular approach is three-fold. First of all, your current employees will feel valued, allowing you to increase morale. Secondly, when future candidates apply to your company, you will have created the sense that you truly do value your employees, making you an attractive potential employer. It also provides immediate benefit in other ways, by allowing you to emphasize the humanity in your company, which creates trust. With that in mind, what do we mean by highlighting an employee? Once you’ve selected an employee, allow them to introduce themselves and how they fit into your company. Give them the opportunity to give a behind-the-scenes look at what they do on a day-to-day basis. You could even do this with the CEO of your company and other leaders. It goes without saying, but of course this isn’t a one-time thing. This is one of those Facebook Live topics that you want to come back to over the long-term. Another one of the many great ideas for Facebook Live is to use it to promote upcoming products that haven’t officially been released yet. Ensure to take advantage of the excitement by providing them with a link to take preorders. You may also want to consider investing in a few higher quality tools to increase the production value of your content, which can help your audience stay engaged. The fact that people will stay tuned into live videos more than three times as long as regular videos is huge for businesses looking to convert, making this yet another one of the leading Facebook Live content ideas on this list. You could even stream your entire product launch, giving your audience a taste of a typically very exclusive event. If you choose to go down this route, now would be the time to go all out on the production of your live stream. All of this brings us to yet another benefit of Facebook Live. It allows you to live-stream to the exact people you want to stream to. Its privacy features are a lot more advanced than other streaming platforms, giving you complete control over who you broadcast to. Webinars, also known as web conferences, are a very valuable business tool that we’ve discussed many times in the past. Whether you host a webinar to do a product demo or “unboxing” to boost affiliate marketing or as a lead magnet, there are many ways that businesses can use webinars to their advantage. Here’s a more in-depth look at why webinars make such effective marketing tools and the ways you can use webinars for promotional purposes, to increase your brand awareness, etc. There are many platforms to host webinars out there, but the great thing about Facebook Live is that not only is it free and simple to use, but you can also market your webinar from Facebook, too. In other words, all aspects of your webinar can be done in one single platform, streamlining the entire process. Similar to the above idea is using Facebook Live to host a live online class – something that you would do over an extended period of time. Information is always a commodity and you will provide your audience with a lot of value by teaching them something that can benefit them in some way. Again, the key is to always know what your audience would benefit the most from. Make your live classes even more engaging by incorporating the question and answer format somewhere in the class, perhaps at the end. Similar to this format is the “series” or even a daily show format. The benefit of doing this kind of format is that it allows you to build a following. You may choose to broadcast your episodes at a set day and time, which keeps your audience coming back because they know when to expect a live stream. In order to be effective, marketing campaigns naturally have to be creative and capture attention in some way in order to be effective. One way to do that is with Facebook Live. In fact, here’s a look at how businesses have already used Facebook Live for marketing purposes. Do you have an upcoming event? Just as we said above, Facebook Live prioritizes live videos in its algorithms, meaning that more people may see your live stream than another type of post. One way to advertise your event is to make a post about how you have an exciting announcement to make; build up the event. Then, use Facebook Live to share all of the details. Ensure that the link to your event is easy to remember (you can use Bitly to shorten the length of URLs, but you also want to include a link to the event in the comments section). However, you can even use Facebook Live to gain additional traction at the event itself by, let’s say, streaming your booth at the trade show as one example. In other words, not only is Facebook Live is a tool that can promote the event beforehand, but it also gives you the unique opportunity to promote the event while it’s happening. By live streaming your event, you also give your audience the opportunity to attend an event they may have wanted to attend but were unable to. People love quick tips – informative pieces of digestible content that doesn’t take up a lot of their time in order to benefit from. Daily tips are entertaining and informative. If you have not yet incorporated Facebook Live into your marketing strategy, doing a “daily tips” format is a great way to get started. Daily tips are meant to be quick, allowing you to get comfortable with being in front of a live audience. Indeed, this is one of the best Facebook Live topics for beginners. At the same time, you get to tap into all of the benefits of video and live video in particular, including the ability to establish a relationship with your audience. Then again, all businesses can benefit from incorporating daily tips into their content. Now, one quick word before we approach the end of this article. While the emphasis of live video isn’t necessarily on a high-quality video, that isn’t to say, as we said above, that your Facebook Live video shouldn’t be high-quality. In fact, a high-quality video can keep people watching for longer and can also reflect positively on your brand in general. Here are some tips to create a high-quality live video. As you can see, the benefits of Facebook Live for businesses are massive.